My earliest memories of being unwell are from my teens. Afternoons feeling like i’d been injected by some kind of tranquilizer, making me feel so incredibly tired that I would just have to give in and sleep. Symptoms of stomach pains/cramps mild at first became gradually more and more painful. Weight loss and feeling faint added to my parents worries. Visits to doctors to get to the root of the problem would bring no real answers.I remember the doctor saying to my parents, just let her eat anything that she fancies!? Things carried on like this for many years with symptoms continuing to worsen, bloating and more severe cramps and nausea. I was often in incredible pain usually lasting the whole night. Doctors then diagnosed IBS ( irritable bowel syndrome) but gave no advice on diet. I remember I was just given peppermint tablets. I had heard somewhere that wheat might be the cause of my symptoms, so I decided to stop eating bread, flour etc. I still had no real information about this, certainly had never heard of Coeliac disease. In my early 40’s after seeing no improvement, feeling I was getting nowhere with the medical profession, I went to see a nutritionist ,I did York tests to identify problem foods. These tests found I was intolerant to yeast and possibly wheat ,(unable to properly test as I had taken wheat out of my diet), also found I had minor intolerance to onion and paprika. With my new found knowledge I left feeling that I actual might have a chance of getting better. But still not sure I really understood the whole gluten free thing.I found this all very complicated initially and seem to remember still eating Rye bread for a while! Even 6 or 7 years ago I don’t think there was much food available gluten free. My nutritionist at the time asked me to remove dairy for 6 months which when I added back again gave me no adverse reaction. Things went quite well for a while, although still was not really 100% yeast free I certainly had the odd glass of wine! Probably still consuming hidden gluten and yeast as I was still very much learning ,and at that time hadn’t found Twitter! I realised I was becoming much more sensitive to my food intolerances bloating ,cramps brain fog and sickness now happening far more often. IBS still given as only answer by doctors. 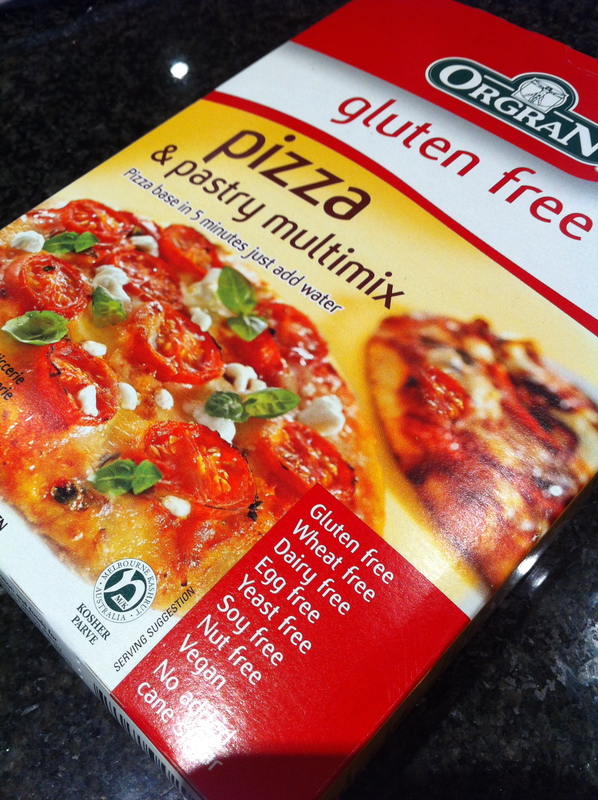 I pressed for a Coeliac test but by then knew that it would come back negative as I had no gluten left in my diet. Doctor knew less about Coeliac disease than I did, and she had to admit I was right and the test came back negative.I was getting nowhere! So this year I found a new nutritionist and at last I really feel things are changing. Also joining Twitter has been an absolute eye opener .Blog posts and tweets have been invaluable. Recently I have taken an Intestinal Permeability test, A simple overnight fast and 6 hr Urine test completed at home. Unsurprisingly the test came back positive for ‘Leaky Gut’ ( intestinal permeability ) At least now I knew what I was dealing with, this certainly would explain why I was becoming more sensitive to foods. I am now on a healthy healing plan, as I like to call it, On my nutritionists advice cutting out all caffeine, sugar and alcohol as well as all foods that I am already intolerant to. My nutritionist has given me L-Glutamine and Liquorice in powder form to help heal my stomach. Including even more green leafy vegetables in my diet, especially cabbage and avoiding fruit except for berries. After 4 weeks of my new plan I started on multi vitamins and a digestive support formula containing marshmallow root etc. 8 Weeks on I am feeling much better, no tiredness, or pain and only occasional slight bloating. as long as I don’t give in to the cake craving or get accidentally glutened! Christmas is going to be a tough time, with many tempting things to eat, I am going to try very hard to be very sensible and remember how much better I am feeling outside and in. Thanks for reading my story, I am certainly no writer but am very passionate about the subject of gluten intolerance and other food sensitivities. Hope this will be of some help . If you think gluten is a problem for you, Go to your doctors straight away while gluten is still in your diet, so tests can be done. The dough was easy to make up and it was all very straight forward. The pizza was soon in the oven topped with some tomato puree, pepperoni and cheese. I have to say I was pretty excited about having Pizza at home, as in the last 5 years or so I’ve only had pizza from Bruschetta Restaurant in Kingston for a special treat (amazing by the way!). 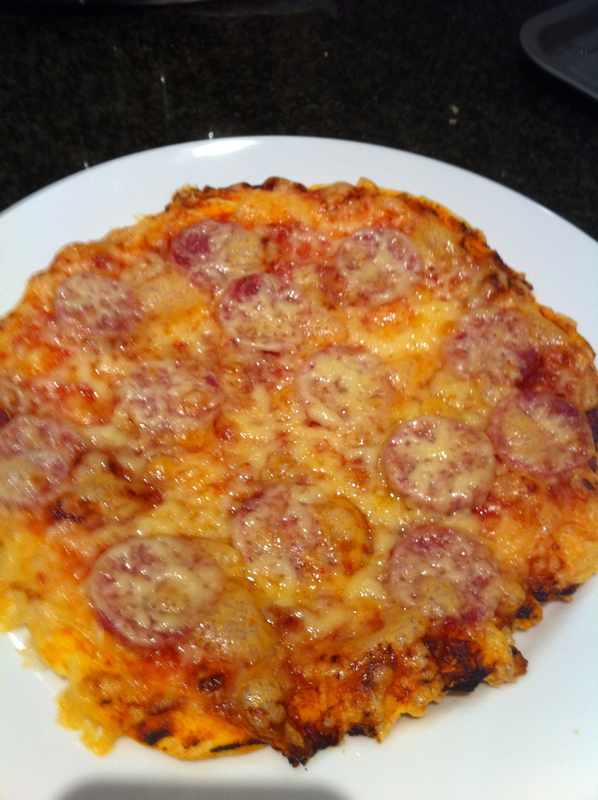 Really pleased with my results, pizza just like I remembered. Definitely not something to eat to often, but made for a great treat.